Mommy and I had such a wonderful birthday yesterday! I want to thank you all for the wonderful wishes you sent us! We indulged in some nip, a little toy playing and, of course, tuna. Now that I'm 4 years old, I have matured enough to realize that I'm a very lucky cat to be living with my family and to have you, my friends and readers, in my life. To celebrate this, I've decided that this year I'm going to give away some prizes to show my appreciation to all of you. Before I let you know how to enter and win the contest, here are the prizes that you'll be playing for. One lucky kitty or doggy is going to win ALL three! All of these prizes have one thing in common - a portion of the proceeds go to help animals in need. 1. A hairy blanket made by none other than the extremely talented Peggy! Samson and I have two hairy blankets and we don't know how we lived without them! 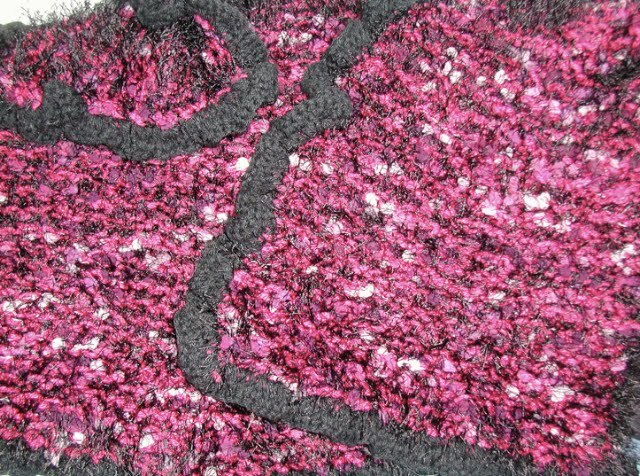 We bid on this blanket specifically for our contest. Isn't it just divine? 2. 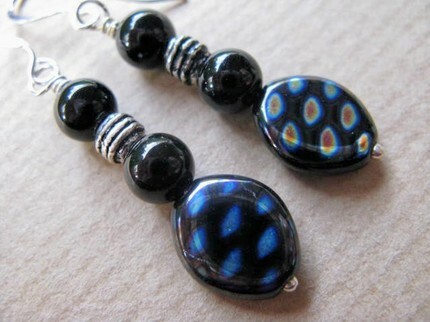 A $15.00 USD gift certificate to The Beaded Tail Etsy shop! Mommy is addicted to the beautiful jewelry in this store and we think that one of you will love to give something wonderful to your Mommy or special lady in your life. 3. 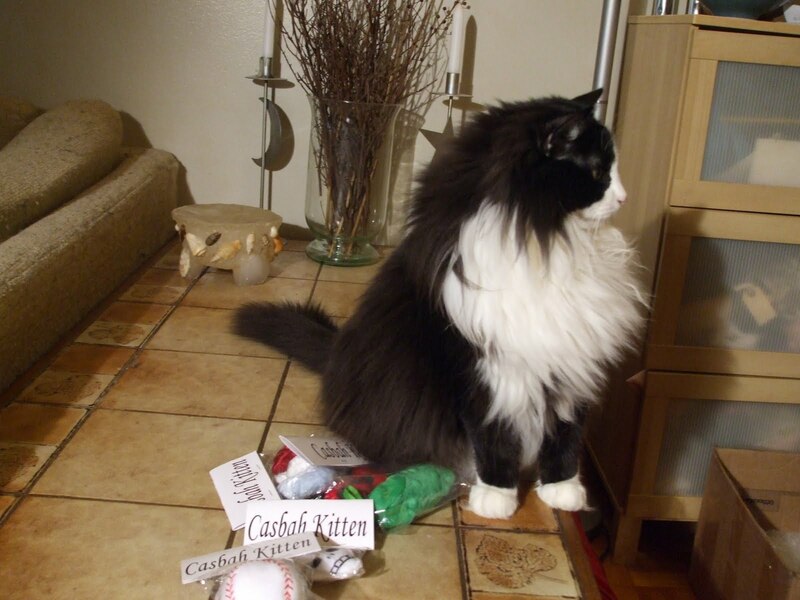 A $15.00 USD gift certificate to The Casbah Kitten Etsy shop! If you've read our blog at all, you'll know that we go bananas over Jane and Alice's special handmade and handgrown catnip toys (hey, speaking of bananas, Samson and I think you girls should make a banana toy!)!! $15.00 dollars will get you something really awesome to play with. They have all sorts of really inexpensive toys for kitties and doggies! Now the contest details. A number of our friends have agreed to model their toes, and every Tortie Tuesday or T(h)ursday for the next week, Sweet Pea and I will be posting a couple of pictures of some mystery Tortie toes and you'll have to guess who they belong to from the list of Tortie models. 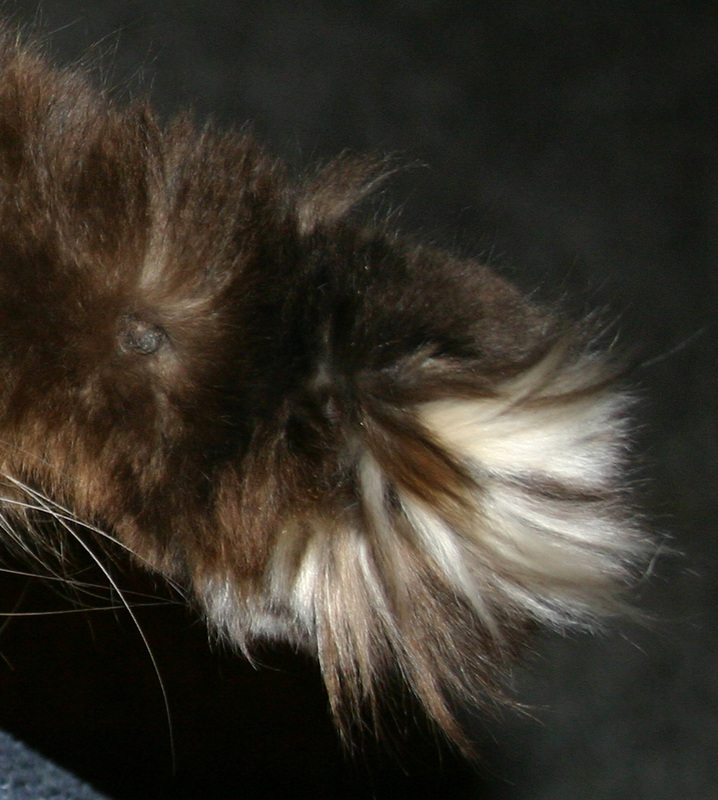 Each Tortie's toes will only be shown once, and we're going to give you lots of hints, so it should be pretty easy (we hope). At the end of the contest you can submit your answers, and everyone who guessed all the toes correctly will be entered in a draw for all THREE of the above prizes. You do NOT need to be a Tortie to win and even if you're one of the models, you can also enter (your own toes will be the easiest ones, we hope!) There is also no restriction on your location. If you have any questions, please email our Mommy at themonkeycats (at) gmail dot com. 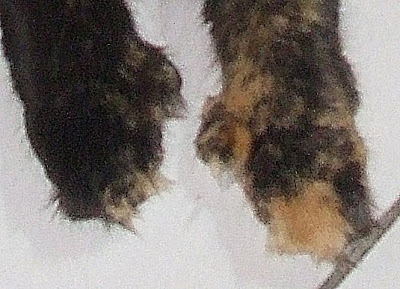 I think the first Tortie toes are the easiest to guess because there is no other Tortie we know with this much floof! This sweet girl's toes are one of a kind, just like the Tortie. The next toes are plentiful and a little strange looking, but wonderful in their own way. I think this young and sweet kitten will eventually learn to open doors with those mittens! If you can guess these two toes, keep note of who they are, because Sweet Pea will have more toes for you to guess on Tortie T(h)ursday! What a great contest!! Full of tortitude for sure!! Fun, fun, fun! Since we're supplying a prize, we won't enter the contest but we do want to guess a few. I hate to say it but we don't know all of those kitties!! So we're guessing for the first two toes. . . Sweet Pea and. . . . . . .Callie??? Cricket SOOOOOO wants in on THIS one! She is begging mom already to take pictures of her toehawky toes. Do we snd the pictures to you or blog about them on our page? This is soooo much fun! I've written my guesses down in a safe place! Wow! This is a tough one! Glad you and your Mom had a good birthday Delilah! How fun! Glad there are 8 of us kitties to put our heads together to figure this out! This is gonna be a tough but fun contest!! Ohh, this will be so much fun! Our angel Callie would have loved to be here for this, so we're especially happy that you're including her in the fun from Over the Bridge. Thanks so much. Delilah, we're glad that you and your mommy had a wonderful birthday yesterday! This Tort-Toes contest is going to be lots of fun and we're so happy to be a part of it! We see some kitties we haven't met yet so we'll go meet them and check out their toesies! THis looks fun! We will try to get Mom to play! This is going to be a fun contest and we will get to see lots of cute kitty toes too! Plus, it is a good way to meet some new torties for anyone who doesn't know the models! Lucky for us we already visit all those blogs - but we bet it will still be tough! This a very fun game. We will be trying to guesses! Wot an absolutely FAB contest. We think it will be great fun ~ but we will be hopeless at guessing. So we will hafta be spectators. Good luck to efurrybuddy though! It's going to be tortitoes galore. Oh this will be a lot of fun, we must admit that we do not know all the kitties participating...so we will have to go and meet all of them! We are gonna study those toes closely...sorry that May Ling didn't get any toesie pictures to you in time! Mommy & Daddy decided to scrub the tile and clean carpets today...they need to get their priorities in order we think! You are so very kind to do this for others. I'm glad Delilah and Mom had a great birthday -- well deserved, too. I don't know all of the kitties whose toes will be displayed, but I'm pretty sure that the first toes are Sweet Praline's and the second toes are Sweet Pea's. This is extremely exciting!! How Fun! This is tough - we're not even sure we can ID Tasha's toes (all of them are different!) We may wait to see more toes before we guess. P.S. We are SO sorry we missed your birthdays! We are glad they were happy! What fun! Let's see if I can identify my own toesies! There's lots of new kitties to meet.